Back-tracking slightly, we present today our previously missing treatment by Rev. Van Horn of Q. 65 of the Westminster Shorter Catechism. The Rev. Samuel Phillips Payson (1736-1801) was a classical scholar and Pastor. His family migrated from England, and his father was a pastor before him; his wife was also a daughter of the manse. He graduated from Harvard in 1754 and pastored in Chelsea, Massachusetts. He delivered this sermon on February 28, 1778 to a State Convention in Boston just before the state constitution was considered.
. . . a government altogether popular, so as to have the decision of cases by assemblies of the body of the people, cannot be thought so eligible; nor yet that a people should delegate their power and authority to one single man, or to one body of men, or, indeed, to any hands whatever, excepting for a short term of time. A form of government may be so constructed as to have useful checks in the legislature, and yet capable of acting with union, vigor, and dispatch, with a representation equally proportioned, preserving the legislative and executive branches distinct, and the great essentials of liberty be preserved and secured. The exorbitant wealth of individuals has a most baneful influence on public virtue, and therefore should be carefully guarded against. It is, however, acknowledged to be a difficult matter to secure a state from evils and mischiefs from this quarter; because, as the world goes, and is like to go, wealth and riches will have their commanding influence. The public interest being a remoter object than that of self, hence persons in power are so generally disposed to turn it to their own advantage. A wicked rich man, we see, soon corrupts a whole neighborhood, and a few of them will poison the morals of a whole community. This is the most sacred principle that can dwell in the human breast. It is of the highest importance to men—the most perfective of the human soul. The truths of the gospel are the most pure, its motives the most noble and animating, and its comforts the most supporting to the mind. The importance of religion to civil society and government is great indeed, as it keeps alive the best sense of moral obligation, a matter of such extensive utility, especially in respect to an oath, which is one of the principal instruments of government. The fear and reverence of God, and the terrors of eternity, are the most powerful restraints upon the minds of men; and hence it is of special importance in a free government, the spirit of which being always friendly to the sacred rights of conscience, it will hold up the gospel as the great rule of faith and practice. The qualities of a good ruler may be estimated from the nature of a free government. Power being a delegation, and all delegated power being in its nature subordinate and limited, hence rulers are but trustees, and government a trust; therefore fidelity is a prime qualification in a ruler; this, joined with good natural and acquired abilities, goes far to complete the character. Natural disposition that is benevolent and kind, embellished with the graceful modes of address, agreeably strike the mind, and hence, in preference to greater real abilities, will commonly carry the votes of a people. . . . A good acquaintance with mankind, a knowledge of the leading passions and principles of the human mind, is of high importance in the character before us; for common and well-known truths and real facts ought to determine us in human matters. We should take mankind as they are, and not as they ought to be or would be if they were perfect in wisdom and virtue. So, in our searches for truth and knowledge, and in our labors for improvement, we should keep within the ken or compass of the human mind. With diligence let us cultivate the spirit of liberty, of public virtue, of union and religion, and thus strengthen the hands of government and the great pillars of the state. Our own consciences will reproach us, and the world condemn us, if we do not properly respect, and obey, and reverence the government of our own choosing. The eyes of the whole world are upon us in these critical times, and, what is yet more, the eyes of Almighty God. Let us act worthy of our professed principles, of our glorious cause, that in some good measure we may answer the expectations of God and of men. Let us cultivate the heavenly temper, and sacredly regard the great motive of the world to come. And God of his mercy grant the blessings of peace may soon succeed to the horrors of war, and that from the enjoyment of the sweets of liberty here we may in our turn and order go to the full enjoyment of the nobler liberties above, in that New Jerusalem, that city of the living God, that is enlightened by the glory of God and of the Lamb. Amen. Words to Live By: We should take the opportunity which a birthday gives to us, as well as other proverbial milestones in our lives, to meditate on the grace of God in Christ in our lives, as well as the work of sanctification which the Holy Spirit is doing within those lives. You might even keep a notebook or journal in which you write down your observation of God’s many providences and blessings. Such a journal can be a great blessing when faith may falter, and it can be a wonderful testimony to your children and your children’s children. February 23: Was Washington a Christian? A Discourse preached February 23, 1862, in the First Reformed Presbyterian Church, Philadelphia. 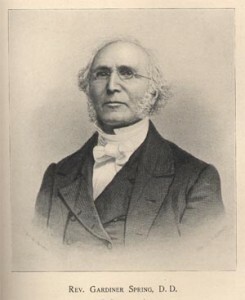 by the Pastor, T. W. J. Wylie. “According to Thy manifold mercies Thou gavest them saviours, who saved them out of the hand of their enemies.” — Nehemiah ix. 27. Why was yesterday, throughout our land, such a day of gladness? It was because, in the arrangements of Divine Providence, a succession of victories which had crowned our arms, was connected, by a delightful coincidence with the recurrence of the birthday of the patriot, the hero, the statesman, who, by universal consent, bears the honoured name of Father of His Country. It was well for us, with gratitude to Heaven, to observe the day; and while reflecting on the evidences which the past presented, that the Lord our God was with us, to gather hope and courage for the future. It is in this aspect then, especially, that we think it proper, to-day, to review the character of that illustrious man, whom our nation delights to honour. We do, indeed, think it would be unsuitable to introduce into this holy place what was purely political; and we consider it highly improper that any should substitute the reading of Washington’s Farewell Address for the usual exposition of divine truth; but we do think it is perfectly appropriate that we consider the illustration which the history of our country, and the life of Washington afford, of the language of our text: God, “according to His manifold mercies, has given us saviours, who have saved us out of the hand of our enemies.” Such men were Washington, and others, and it is proper for us to acknowledge, with gratitude, the manifold mercies of that gracious Being who raised them to save us from the hand of our enemies. In thus referring to the history of Washington, we invite your attention, first, to his early life. We desire, naturally, to trace a mighty river to itds fountain; and as we notice how it gushes from the mountain-side, in some dark glen, almost entirely concealed from view; and as we trace its widening, deepening course, till it swells into the majestic stream, which floats a navy on its bosom, we admire the more the grandeur of a development so great, from a beginning so small. We ask what influences have produced such a result. So in the career of great men—so in the history of Washington. One of our first inquiries is, What was he when a child? How was formed then that noble character, which has gained him a place so exalted in the annals of our race? One of the principal features of his character was filial obedience. He was remarkable for the respect which he always showed his widowed mother. When quite a young man, a commission was obtained for him to enter the British Navy as a midshipman. His mother had given a reluctant assent, and all the necessary arrangements had been made. The vessel was lying in the Potomac to receive him on board; his baggage was ready; he was just going to say farewell, when he observed that his mother’s heart was grieved, and he resolved to remain. The firm spirit which never quailed before a foe, was bowed by a mother’s love. His whole career was changed. Had it not been that he was thus influenced, how different would have been his subsequent history, and ours! Such was his general, we doubt not but we may say, his uniform character. When some one, after the great victory which terminated our Revolutionary War, hastened to announce the tidings to his mother, her reply was simply, “George was always a good child.” We question if any of the honours which were heaped upon him were more grateful than this praise from the lips of her whom he so much loved and revered. He displayed in youth an intrepidity which foretokened the courage he afterwards manifested. The traveller who visits the Natural Bridge in Virginia may notice how one person and another, desirous of leaving a record of his existence, has climbed up its almost perpendicular sides and carves his name on the soft rock. High up above the rest is the name of Washington—the steady heart, the firm hand, the strong foothold of the boy, corresponding to the character of the man. His habits of system and industry were remarkable from early life. In the language of an old writer, he “endeavoured to live by rule, and therefore had a rule to live by.” When he was about thirteen years of age he prepared a blank book to make a record of such things as he considered worthy of especial remembrance. Among other articles entered in this book we find a number of rules of conduct for the young. Some of these indicate the leading elements of his future character. “When you speak of God or his attributes, let it be seriously in reverence.” “Labour to keep alive in your breast that little spark of celestial fire called conscience.” “Be no flatterer.” “Show not yourself glad at the misfortune of another, though he were your enemy.” “Let your conversation be without malice or envy.” “Detract not from others, neither be excessive in commending.” “Undertake not what you cannot perform, but be careful to keep your promise.” “Let your discourse with men of business be short and comprehensive.” “When you meet with one of greater quality than yourself, stop and retire, especially if it be at a door or any straight place, to give way for him to pass.” “In your apparel be modest, and endeavor to accommodate nature rather than to procure admiration.” “Play not the peacock, looking everywhere about you, to see if you be well-decked; if your shoes fit well, if your stockings sit neatly, and clothes handsomely.” One of the books which belonged to his mother, and which was found in his own library, having evidences of frequent use, was the writings of Sir Matthew Hale; and there is reason to believe that the valuable counsels which it contains were enjoined by his mother, and adopted by himself, for the regulation of his life. His love of truth is shown by incidents in his history which are as familiar to all Americans as household words. His sense of justice, his impartiality and decision of character were conspicuous even when he was a child. His companions had such confidence in him that they were in the habit of calling on him to settle their disputes. Although naturally courageous, he would neither fight with his schoolmates himself, nor allow them to fight with each other, and braving their displeasure, he would inform the teacher in order to prevent such combats. But we pass to consider his character as he entered upon public life—as the soldier and the statesman—in both the Christian. To continue reading this discourse, click here. 1. What type of “good” is this commandment speaking of, temporal or spiritual? It is not simply a matter of living long upon this earth but it is a long life of living for a reason-the glory of God. It is real living, living with a purpose and a blessing. 5. What kind of prosperity is promised? 6. Does this mean that all believers in Christ will have long life and prosperity? 7. Why is the fifth commandment the first commandment with promise? Our Question from the Catechism has a lot to say regarding this age in which we live. Yet we are forgetting this important teaching, we are forgetting that there are such things as superiors and inferiors and both have responsibilities. We are forgetting that we can not, dare not. bypass the teaching of Scripture in any realm. In I Peter 2 and 3 we find many instructions regarding this matter of honoring our father and mother—or, as has been expressed in the foregoing, our relationships to others whether we are superiors or inferiors or equals—and it would do well for us to take heed to what Peter says. We should remember that Peter is God’s spokesman and such that should end the matter. We should remember that the instructions given by Peter are pertinent for today in spite of our likes and dislikes. Peter concludes his counsel by stating: “Finally, be ye all of one mind, having compassion one of another …. ” He tells us that we should show love, we should be pitiful and courteous. He tells us we should not fight back. He tells us that we should be careful that our tongues do not speak evil. He tells us that we should seek and pursue after peace. Why does he tell us these things? Why is it necessary for us to know them? It comes to us in The Word because Peter, under the direction of the Holy Spirit, was being consistent with the rest of Scripture. The Holy Spirit is always trying to teach us that we have responsibilities in this world. some of us as superiors and some of us as inferiors. But our responsibilities toward one another are ever present and we can never bypass them. This is true of those who are not saved but it is even more true of those who have called upon Christ as Saviour and Lord of their lives. In the midst of these days of trouble, we are called by God to peace and concord. We must, by His grace, be willing to follow the teaching of The Word in all areas—that is if we would love life and see good days. Published By: The SHIELD and SWORD, INC., Memphis, Tennessee. Vol. 4 No. 60 December, 1965. Rev. 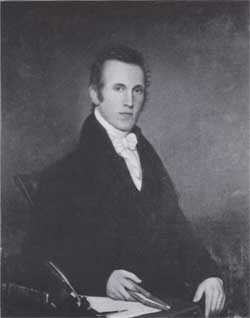 Leonard T. Van Horn, Editor. Originally a lawyer (and cousin of an early President), the clergyman James Madison (1749-1812) had high academic potential (even teaching philosophy and math at the College of William and Mary) and was ordained to the Anglican ministry in 1775. Shortly thereafter he was appointed to the presidency of William and Mary, where he served until 1812. 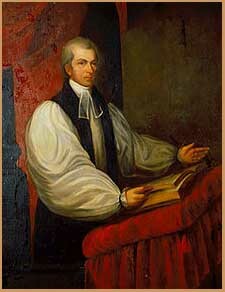 He was consecrated at Canterbury in 1790 to become the first American born bishop of Virginia. Madison, though an Anglican, was a firm supporter of the Revolution, even venturing on occasion to speak of the kingdom of heaven as a “republic,” a political sentiment that raised eyebrows among loyalists and applause to be sure among colonists. He fought with the revolutionaries against Britain in the war. A polymath (a surveyor, cartographer, science teacher, and economics professor, using Adam Smith’s The Wealth of Nations as a text! ), Madison was a faithful preacher as well. Closer to the present, the recent history also showed God’s providence and tender care for these colonies. As a banner, and as a moral obligation, he asserted that this providential tract was: “unequal, bold and hazardous as it appeared in its commencement, [not] soon terminated in the establishment of liberty and independence, [but] soon held aloft to the nations of the earth, the sublime example, which called, and still calls aloud, awake, awake, put on strength, O nations of the earth; awake as in the ancient days, in the generations of old.” That was America’s place. Rather than spawning a “presumptive arrogance,” America was called to lead the world in liberty. Yes, brethren, if the effects, which we have, in your hearing, thus slightly traced; if the period of time when America was discovered, the necessity and the consequent production of other means for the restoration of human rights, than those, which had hitherto operated; if her origin, and the consequent possession of a principle, which, nurtured and matured, is now pervading, and will animate and excite the whole family of mankind to vindicate their lost rights; if her astonishing progress from infancy to the station, which she now possesses, a progress, which the opposition of a ten-fold force served only to accelerate: if, become free and independent, having accomplished the most unparalleled revolution, a revolution unstained by fratricide, or the blood of the innocent, she hath given to nations the first lesson by which their rights may be preserved . . . ; if she hath established upon a rock, the empire of laws, and not of men; if America, as a tender and affectionate daughter, is ready, from her exuberant breasts, to afford the milk of regeneration to her aged and oppressed relatives; if, in short, from a beginning the most inauspicious, she hath thus outstript all political calculation, thus risen to this day of glory, thus ascended on high, thus triumphed over every obstacle, and if all these be effects worthy of the divine interposition, then we will still cherish the fond idea, we will cling to the full persuasion, that our God hath been, ‘our strength, our refuge, and our fortress,’ a God, who, at the birth of creation, destined man for liberty, for virtue and for happiness, not for oppression, vice and misery. “Gratitude, warm and fervent, united to a sincere resolution ‘to fear and to serve him,’ is the return” that fits this divine beneficence. Certainly, my brethren, it is a fundamental maxim, that virtue is the soul of a republic. But, zealous for the prosperity of my country, I will repeat . . . that without religion . . . the religion which our Saviour himself delivered, not that of fanatics or inquisitors, chimaeras and shadows are substantial things compared with that virtue, which those who reject the authority of religion would recommend to our practice.—Ye then who love your country, if you expect or wish, that real virtue and social happiness should be preserved among us, or, that genuine patriotism and a dignified obedience to law, instead of that spirit of disorganizing anarchy, and those false and hollow pretences to patriotism, which are so pregnant with contentions, insurrections and misery, should be the distinguishing characteristics of Americans; or, that, the same Almighty arm which hath hitherto protected your [country] and conducted her to this day of glory, should still continue to shield and defend her,—remember, that your first and last duty is ‘to fear the Lord and to serve him;’ remember, that in the same proportion as irreligion advances, virtue retires;—remember, that in her stead, will succeed factions, ever ready to prostitute public good to the most nefarious private ends, whilst unbounded licentiousness, and a total disregard to the sacred names of liberty and of patriotism will here once more, realize that fatal catastrophe, which so many free states have already experienced. Remember, the law of the Almighty is, they shall expire, with their expiring virtue. Centuries later, columnist William Safire suggested that Ronald Reagan’s “It’s Morning in America” speech could have been taken from this Madisonian homily. Online versions are posted at: http://oll.libertyfund.org/titles/816 and http://quod.lib.umich.edu/e/evans/N22012.0001.001?rgn=main;view=fulltext. A printed version is contained in Ellis Sandoz, Political Sermons of the American Founding Era (Indianapolis: Liberty Fund, 1998).